We’re darned lucky with eating options throughout our region. 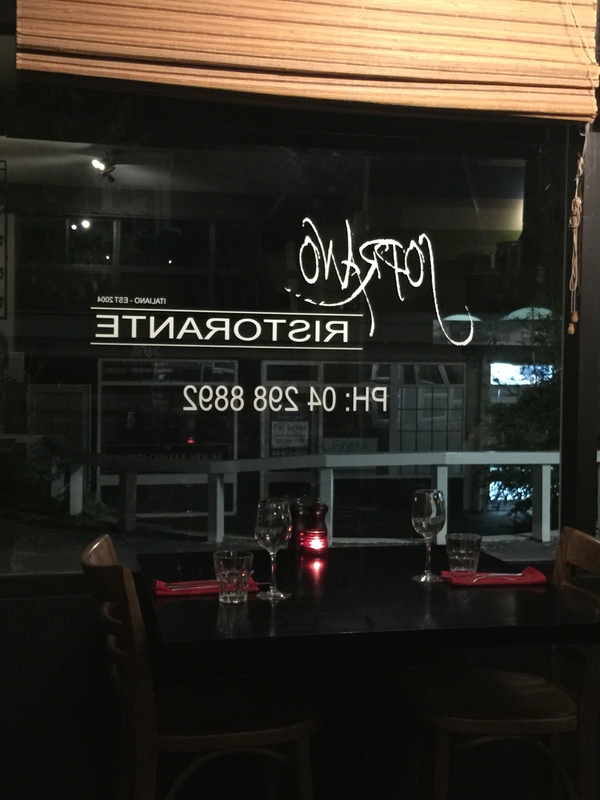 I finally got to Soprano Italian Ristorante at Paraparaumu Beach for dinner, and the Marine Parade Eatery for lunch. Soprano I’d missed out on previously because it was totally booked out, so I didn’t fall into that trap twice (and it was half full by 7pm on a mid-week night). The environment is warm and cosy with mellow music and welcoming staff (yes the picture is back-to-front as I really liked the textures and vista looking outward from my spot). 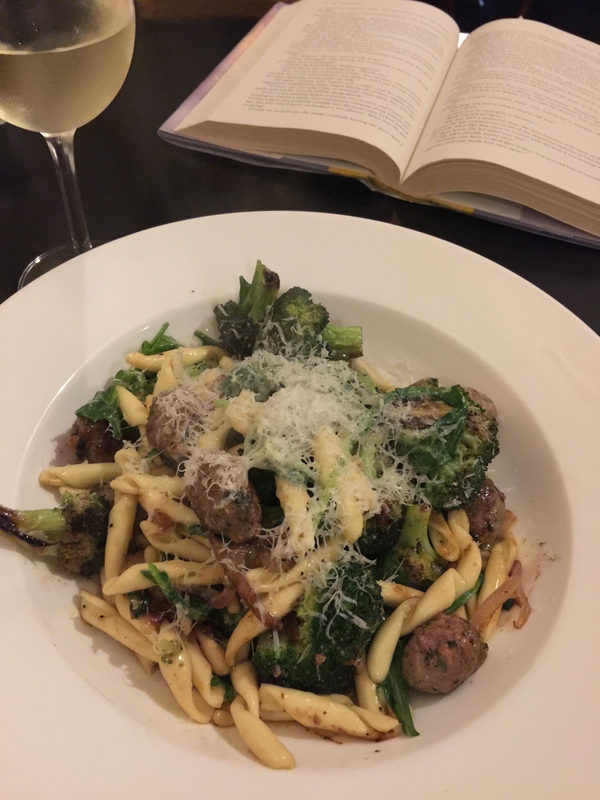 Although several entrees appealed to me (twice cooked cheese souffle with apple; walnut and crumbled goat cheese salad; Waikanae crab and ricotta ravioli with lemon chives and butter sauce), I also was feeling the need for greens so headed to the Boccoli e Broccoli pasta with sauteed Italian sausage, roasted broccoli, pine nuts, basil pesto and arugula. And very good it was too. Tasty herbacious sausage from the Waikanae butchery, a generous amount of roasted broccoli and a well balanced dish overall both flavour and texture-wise. The accompanying Mount Riley Chardonnay was luscious and complimented the pasta well (lightly oaked with a palate of citrus and stone fruit). The owner popped by all tables to say hi, which was a nice touch, and given there were several desserts I couldn’t fit, I’ll most definitely be back (entree and dessert next time methinks). 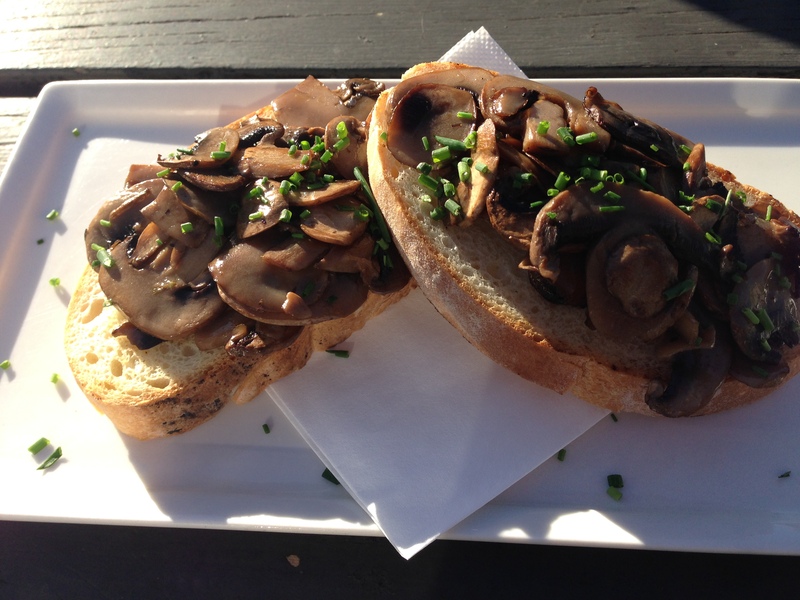 The Marine Parade Eatery is more of your funky daytime (and some evenings) cafe and deli. But also with good food, ambience and service. I liked the whole loaded shelves of goodies, rustic tables, fresh flowers, and light bright airiness despite the miserable day outside. 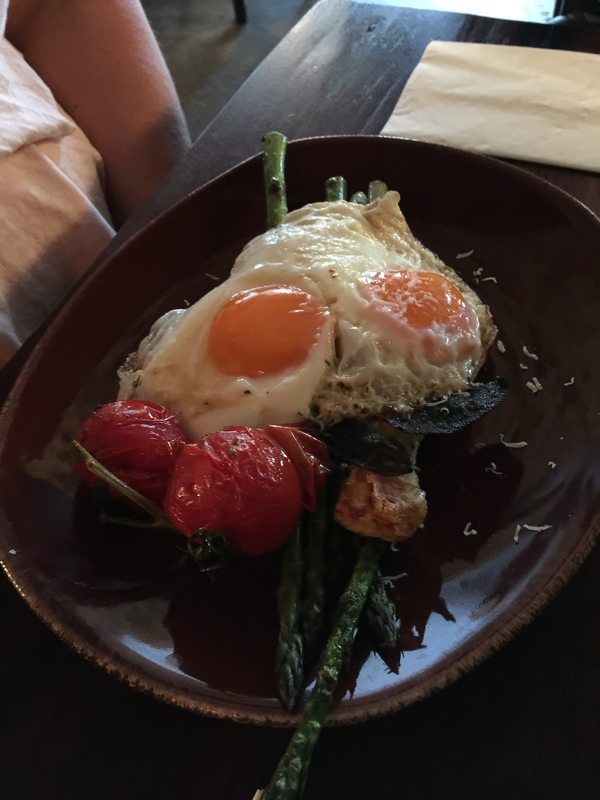 The menu here leans towards plates, large and small, and tapas in the evenings (as well as other events like the shared Sunday Roast on the last Sunday of each month – keep an eye on their FB page). I wasn’t after substantial, so chose the risotto small plate, which turned out to be mushroom and parmesan, with an accompanying winter warmer lemon, honey and fresh thyme drink. 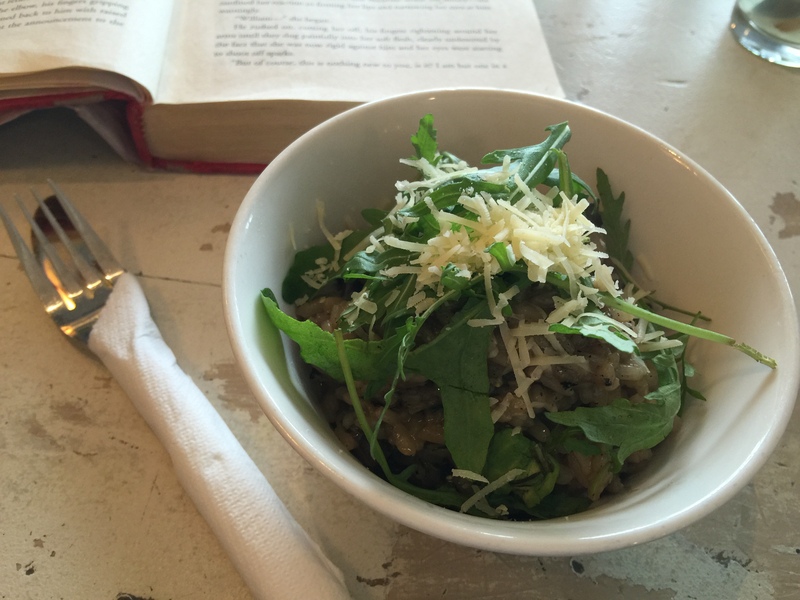 The risotto was pleasingly al dente, with a subtle green taste alongside the mushroom. And the drink had real thyme and was mellower but nicer for that. Both impressive. Most of the offerings had interesting components (jerk marinated chicken with a zesty bulghar wheat, sweet corn, capsicum and toasted seed salad; sardines and grilled tallegio on toasted ciabatta with fresh tomato and herb salsa; lemon, honey and cayenne pepper hot drink; peppermint hot chocolate), and all looked very appealing. They also do $10 daily stuffed bagel specials, and the cake cabinet looked rather delicious as well. I’m definitely coming back sometime with a good hunger on! You will find Soprano in the Copperfields Complex at the Beach doing Monday-Saturday evenings. And Marine Parade Eatery at 50 Marine Parade, currently doing Wednesday-Thursdays 7.30am – 2.30pm, and Fridays-Sundays 7.30am – 9pm (keep an eye on the hours adjusting seasonally). There’s no two ways about it, Paraparaumu Beach is a wonderful spot for a mini-escape. So you can tell its summer and I’m getting a little more riding in (motorised, yes). My last sojourn out of the city took me to Paekakariki’s Perching Parrot cafe, Paekakariki meaning perching place of the kakariki – green parrot (bet you didn’t know that huh?, me neither prior to Friday). So the Perching Parrot is a funky indoor/outdoor cafe in the main street of Paekakariki, doing lots of vegan and vegetarian dishes with fresh seasonal ingredients, a cabinetful of delicious-looking cakes and slices, and a great array of Siggy’s famous-on-the-coast pies (although these are not so vego), and Havana coffee. My spinach and feta fritters were fresh, tender and flavourful, and accompanied by a generous green salad. The service was friendly and welcoming, there’s a good array of reading material and one can pop next door to the Beach Road Deli afterwards to buy goodies for a delicious home-made platter for dinner. The delicious almond shortbread bought from the Paraparaumu Beach Market before the wind and rain washed them out (and the Mary Potter Hospice Strawberry Festival unfortunately). The [south] Raumati Social Club’s sage eggs and quinoa/kale fritter specials (and we loved the myriad carpets on the ceiling and that there was a ‘comprehensive’ breakfast option on the menu). 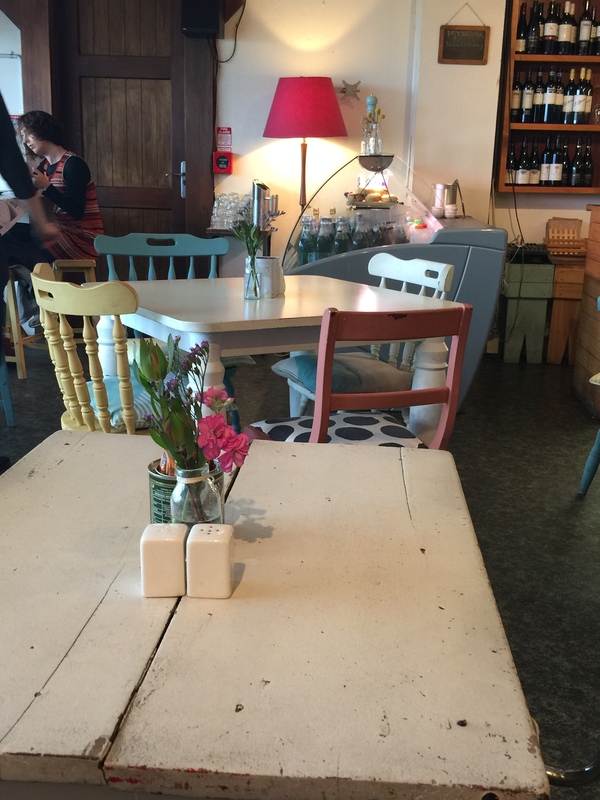 The Long [Waikanae] Beach buzzy environment, delicious prawn popcorn, almond pear tart (later found to have come from the local Olde BeachBakery around the corner – see below), great service and fabulous tea cosies. Also noted the new North End micro-brewery being established in the cafe so that the return visit for delicious looking (and very popular) pizza can be accompanied by a craft brew. Nice. The roti with spicy peanut sauce and warming flavourful red duck curry at Muang Thai at Paraparaumu Beach. The scones at No 6 Cafe at Raumati Beach (simply the best we’ve had in ages, both date and cheese). 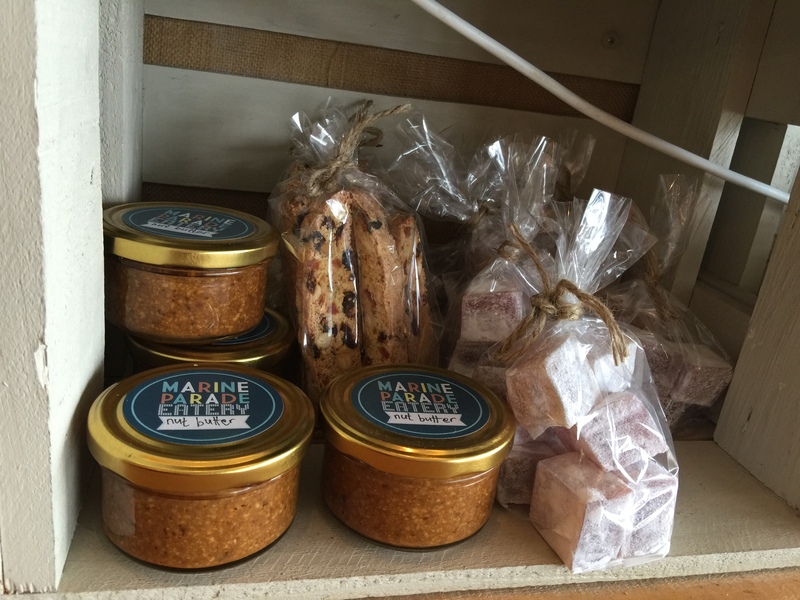 Everything at the Olde Beach Bakery at Waikanae Beach. I could have just pulled up a chair and stayed all day. In the end, I took home flaky well-made pies for dinner. Relish Cafe’s warm bacon and avocado salad. Simple but tasty, in a wonderful cottage environment. to weather) and Soprano Italian Restaurant (also at the Beach and booked to the gunnels prior). We are so, so lucky with our regional offerings, as well as what we tend to focus on in the city. 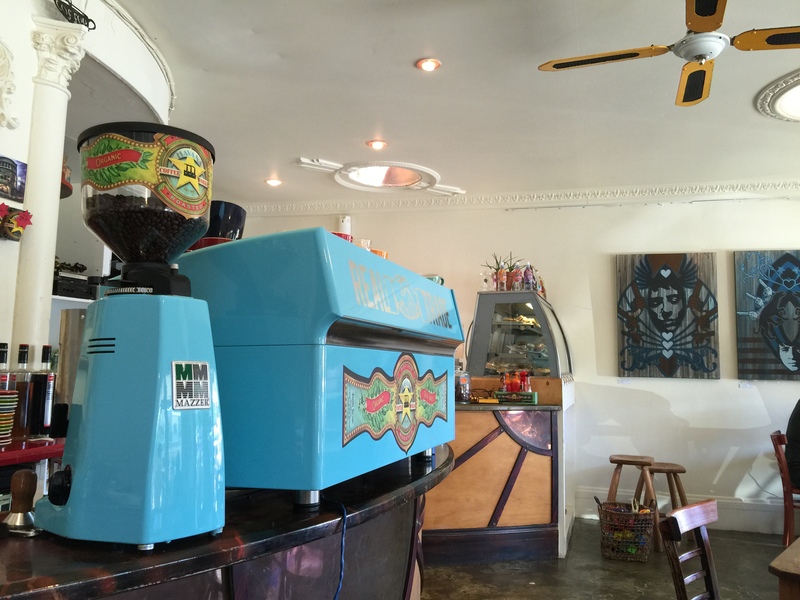 I am going to talk about Waimea Cafe and Restaurant, but firstly I have to talk about Max Christie. to notice what I was eating such was the passion and presence of this young man (and for those who know me, you’ll know that’s almost unheard of). 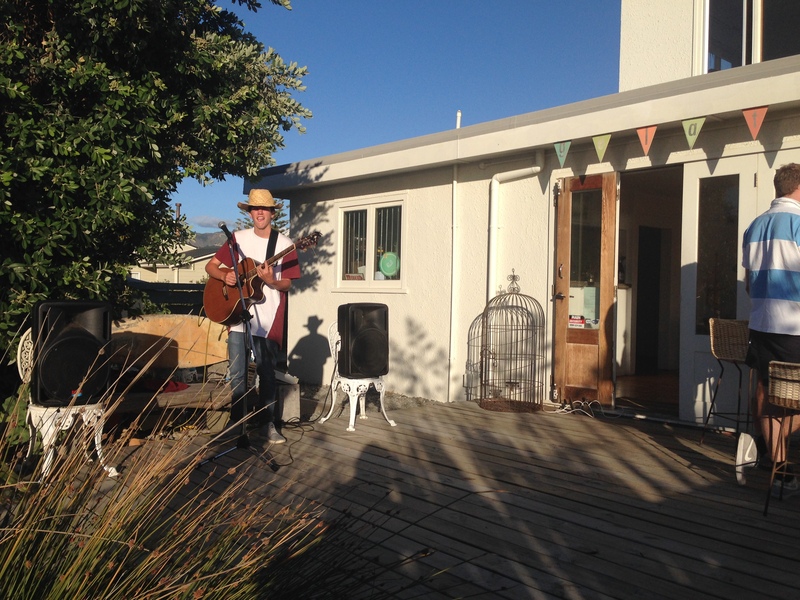 So, although Max doesn’t yet have a formal marketing presence via the web or Facebook and needs to be a little older for pub gigs, keep an eye out for opportunities to see him in action (and the technical part of our household commented that he has extremely good modulation, which is apparently a very good thing) – keep an eye on Waimea Cafe’s Facebook page for info on who’s performing and when. And so to Waimea Cafe. The best thing about Waimea is the location. Up on the beach front at Waikanae. With regular live music in the sunshine. Pretty hard to beat. The next best thing about Waimea is the staff. Friendly, welcoming, humorously bantering, and not missing a trick service-wise (replacing cutlery, noticing drinks were ready for refills, explaining menu items, ensuring sated and satisfied). The third best thing is the breadth of offerings. Tasting plates, sharing platters, bigger meals, fun cocktails, a raft of craft beers, wines, front deck casual spaces, inside slightly more formal, etc (and a damned fine ladies toilet). The menu leans towards seafood and mediterranean, with dishes like penne with tuna puttanesca, Italian lardo with agro dolce onions on toasted ciabatta, cucumber salad with potato, olives, fennel and yoghurt dressing, Waimea crab ravioli with crab bisque (keen to try that next time), Waimea seafood plate to share, etc. Many online reviews talked about small servings for prices charged, but we found them to be satisfactory. 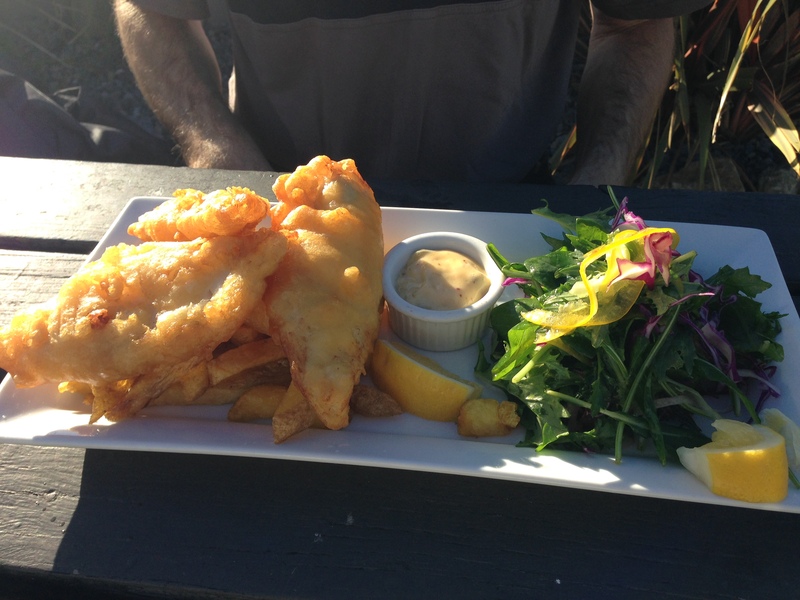 Especially the $23 Sacred Water Pilsner battered fish and chips (monkfish no less) which had three fairly substantial pieces of fish on hand cut chips, and perfectly satisfied Mr Him Indoors. Two of our three dishes (two tasters) could have done with a little more seasoning though and I’d like to sample more of the seafood options next time to really judge the food quality I think (ergo arrive with empty stomach). 1 Waimea Road, Waikanae Beach.